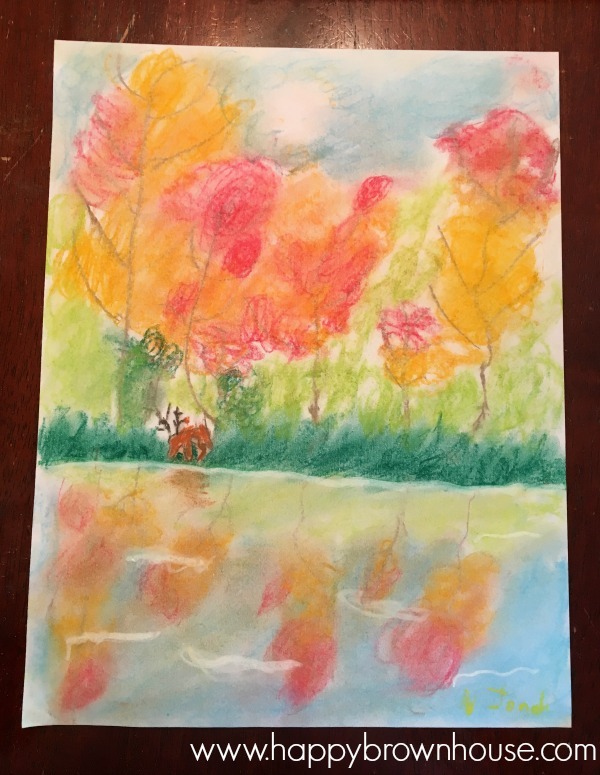 Studying art in homeschool tends to be one of those things that you want to do, but it often gets pushed to the side when your homeschool day is filled with reading, writing, and arithmetic. Trust me, I know. 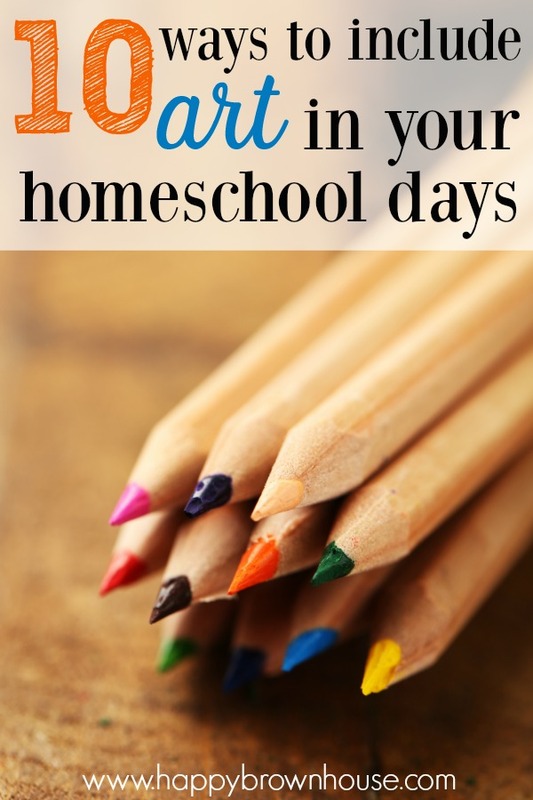 However, I’ve found that there are some easy ways to include art in your homeschool day while still studying your core subjects. These 10 Ways to Include Art in Your Homeschool are sure to enrich your homeschool days even if you’re not artsy. There’s no rule that says your kids have to sit perfectly still while you read to them. In fact, some kids need to be doing something with their hands to be able to listen well. 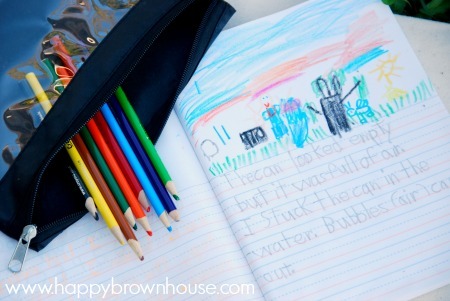 Why not have your kids draw what they are listening to during the read aloud? Kids can illustrate the story and then write a quick summary of what they heard. You don’t even have to be that fancy–kids can simply color a picture that goes along with the story. For example, you can find some great coloring books for learning about medieval times, the American Revolution, life in Ancient Rome, and even Bible stories. Some of my favorite coloring books for history studies are Dover coloring books. These work out well for us while we’re doing a longer read aloud because our chapter books are usually tied into our history in some way. The art and literature connection can be taken even further by creating pieces of art inspired by books. You simply read a book and create! Picture books are great for this and kids can come up with things you’ll definitely want to keep. For some ideas, check out this Giant List of Story Art Projects. History and Social Studies lend themselves very nicely to including art in your homeschool. For example, while you are studying a particular time period, study the art or famous artists of that time. Art and history go hand in hand. It’s worth taking the time to study how these two intersect because they both influence each other. I’ve used the history chalk pastel lessons from You Are an Artist in some of our history lessons and it is a great way to connect history and art. My kids love these! History also lends itself nicely to crafty art projects. 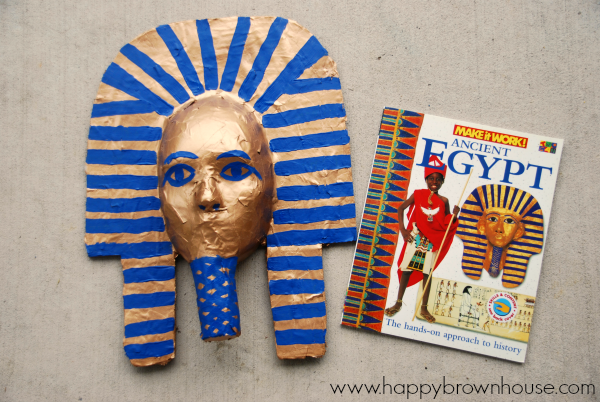 For example, while we were studying Ancient Egypt and King Tut, we made a King Tut Burial Mask. While we were studying Morocco in geography before our trip to Epcot, we made mosaics. Use your unit studies to drive your art. Writing and art are easy to pair together. Some pieces of writing lend themselves to illustrations so easily. Having your child illustrate their stories is a great way to incorporate art into the writing process. Fun writing and illustrating activities can include comic strips–kids love those! Or, why not have your child make a piece of art and then write a poem or story that goes along with it. We’ve even added drawings to our notebooking pages. Including art in science is super easy. Have your little scientists draw diagrams of what they are studying. You can do this for almost every topic–parts of a flower, the water cycle, cells, and many more. Another way that I include art in science is by having my kids keep a science journal with drawings and explanations of our science experiments. My youngest loves this. Plus, it’s a great record of their learning and understanding of the topic. Have kids keep a nature journal to record their nature walks. They can draw interesting things they see on their nature walk–birds, flowers, insects, etc. We load up our Nature Walk Bag with our nature journals, colored pencils, and our copy of 100+ Creative Nature Walks and head to the woods. Allow your child to make connections with the painting and their prior knowledge the same way you would do with literature. And that’s it! It’s pretty simple. I’ve heard it recommended to do several paintings in a row by the same artist to get a feel for the artist’s style and be able to compare between the paintings, but you are certainly welcome to do your own thing. We often make this part of our morning time and it only takes a few minutes. Usually by the end of the week my kids are feeling pretty done with school. Yours, too? Why not make Fridays fun by having art afternoons? For example, our curriculum, My Father’s World, tends to schedule the bulk of the work on Monday through Thursday, leaving Fridays more open for nature walks and other pursuits. This mostly 4 day work schedule works well for us because of piano lessons that are scheduled in the middle of the day. By the time we go to piano and get back, I’ve lost my kids’ attention. So, I turn that into our fun day and we do other things. We do online cooking lessons through Kids Cook Real Food and we do our online art lessons. 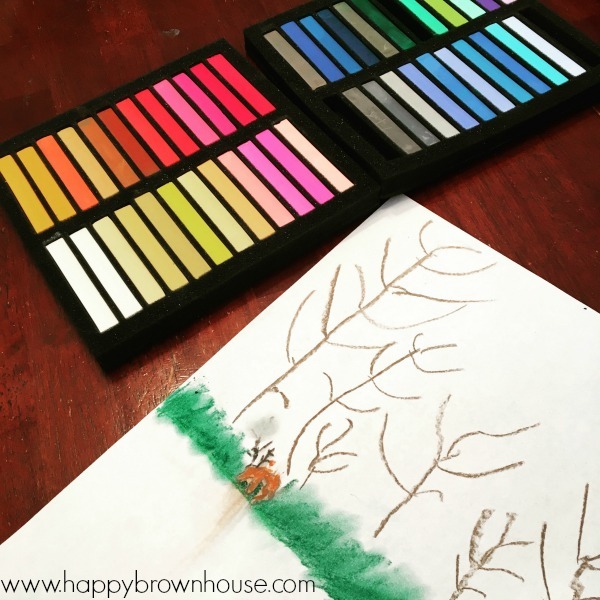 My kids love this time of creative exploration and it helps me feel good that we are still including things like home economics and art in our homeschool. It’s a win-win situation. There are several field trip ideas that include art. An easy homeschool field trip that every homeschooler should take is a trip to the art museum. Gather a few friends and make a day of it. For something fun, see if you can find a local pottery painting place and have the kids paint a piece of pottery. Kids will love having a special plate at the dinner table that they painted. There are tons of options to choose from–plates, cups, and even little figurines. Another art field trip idea is to go to a local paint studio where they walk you step-by-step through a painting. One of the local paint studios hosts a class for children once a month. 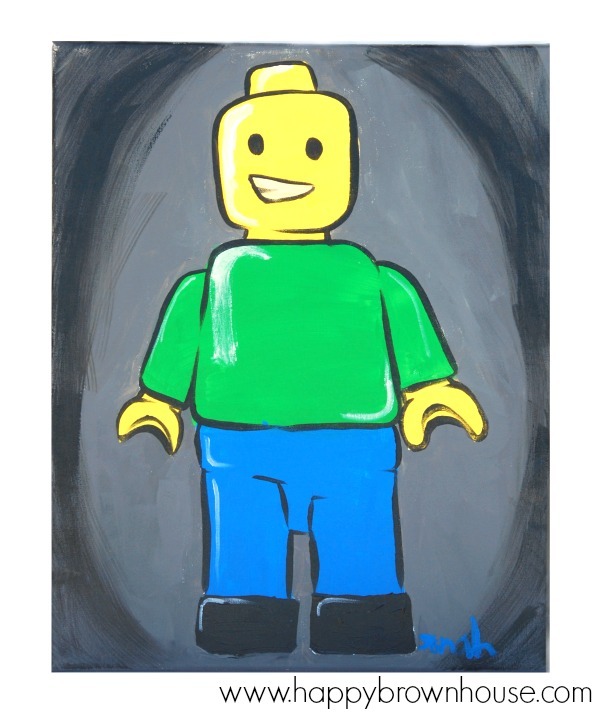 I took my oldest to one and he painted a Lego Minifigure on a canvas that now hangs in his room. It was a fun time of bonding, but also a great experience for him. Co-op art classes can be so much fun! Whether it’s process art for preschoolers or story art projects for the big kids little artists will love having a dedicated time for art with their friends. If you’re the crafty type, you can teach these fun co-op classes that don’t require a whole lot of prep time. Plus, the other moms will probably thank you because they won’t have to do it. (Getting teachers for co-op classes can sometimes be like pulling teeth.) Get some ideas with this list of 5 Homeschool Art Classes Anyone Can Teach. Taking art classes is great for kids who love art, but I’ve found that they are a bit out of my budget. However, I have found that online art classes are a fun and economical way to study art. The great thing about online art classes is that you can do them at your convenience on your time schedule. While the kids won’t get feedback from an art teacher, they will be exposed to art. Online homeschool art classes are a great introduction to art. Then, if your child is passionate about it, you can pursue local art classes. There are lots of free art tutorials online. (Art for Kids Hub is our favorite free art tutorials.) However, I have found some great paid online art classes that my kids absolutely love and I believe are worth the price– Masterpiece Society Studio and chalk pastel art lessons from You Are an Artist. Both of these online art classes are worth paying for. They are both so well done. You really can’t go wrong with either one. Masterpiece Society Studio is full of art lessons and art appreciation curriculum. There are video-based mixed media lessons in a variety of topics, step-by-step drawing tutorials for grades K-2, and classes in drawing, watercolors, acrylics/oils, and pastels for the tweens and teens. My youngest son loves following along with the mixed media art lesson videos and creating art to hang on the wall in our basement school room. 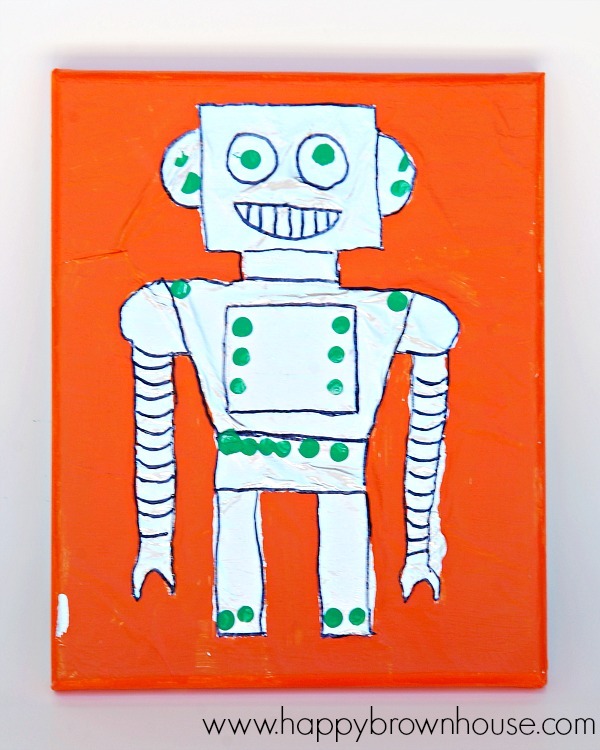 His latest masterpiece was a robot using aluminum foil on a canvas. It’s absolutely adorable! You Are an Artist focuses on using chalk pastels to create art. These are also video lessons walking the kids through a step-by-step drawing using chalk pastels. There are a ton of themed topics available including seasonal/holidays, nature, science, and history lessons. We have used these to go with our unit studies and they have been great additions. My kids love watching “Nana” walk them through a lesson and will always join in when she ends each lesson with the words “You are an artist!” You can join with the You Are an Artist Clubhouse membership, but you can also purchase each course individually to tailor it to your needs. I can’t recommend it highly enough. It’s so good. Listen, I get it. You may be thinking about the mess and the clean up of art projects. You may be thinking that you don’t have time for art. However, homeschool art is important. Fostering your child’s creativity and exposing them to great art is something you won’t regret. People express themselves through art, music, writing, and dance. Art, in its many forms, can help you process emotions, make you calmer, and help you communicate. Let’s stop worrying about the mess and get creative.